A beautiful day for a hike! Not that it was sunny. No, it was overcast and gloomy. But the temperature was crisp, cool, and invigorating. Even early in the morning, I started passing large quantities of people on the trail. Not thru-hikers, though--I wouldn't see any thru-hikers today, but it seemed like everybody and their uncle was out backpacking on this beautiful Saturday afternoon. A regular highway of people, which at first didn't bother me much, but increasingly throughout the day found myself slowed down from their constant stream of questions. It got to the point where I'd see someone up ahead of me on the trail and I'd hope I could blaze past so fast that they wouldn't have enough time to stop me with questions. Maybe I should just flat out lie and say I'm not really a thru-hiker? Or that I'm trying to catch up with some cute girl up ahead on the trail and didn't have time to talk. How would they know better? 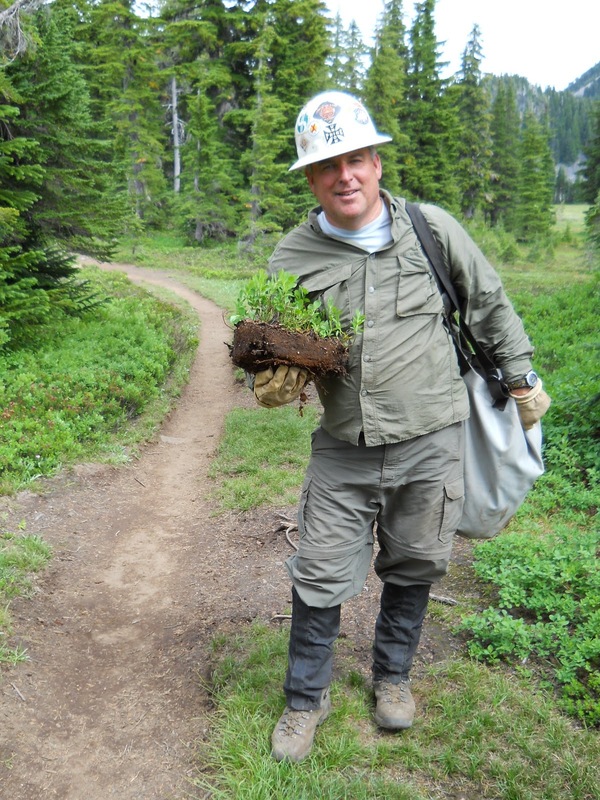 At Jefferson Park I met another trail crew fixing all of the social trails in the area, pulling up patches of grass and plants from somewhere out of site and replacing it on the social trails to discourage their use. This was one group of people I didn't mind stopping to chat with since I had done some trail work in past years and enjoyed it. I wanted to ask my own questions about who they were, how long they were out there, and what all they planned to accomplish. =) This group was made up of volunteers from the PCTA, and they were only out for the weekend. A few of them also took a couple of cross-cut saws to cut out some blowdown on the trail nearby. Chainsaws weren't allowed since they were in a wilderness area. I was half tempted to stop for the day and start helping them! It's a good feeling to do some trail work. If you ever get the chance, I highly recommend it. 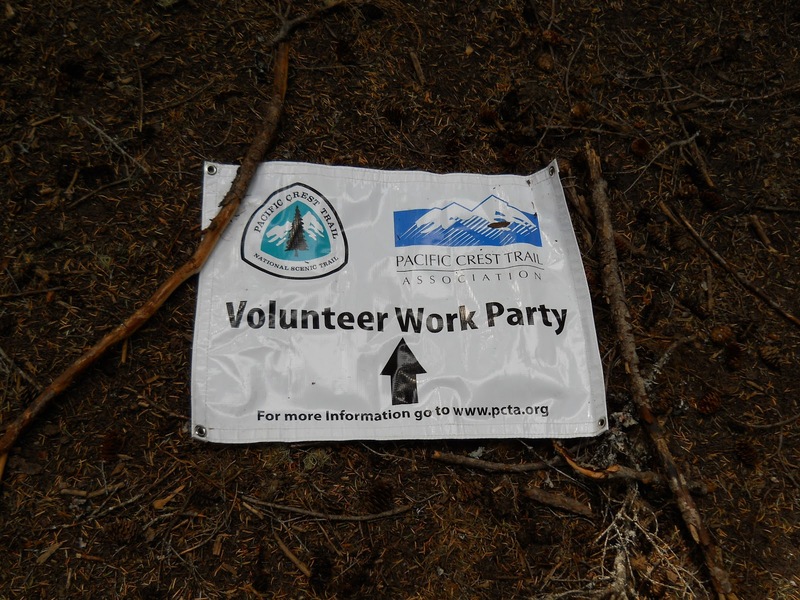 I've never done any worth with the PCTA, but I have done several trips with the Washington Trails Association (and, in fact, was raising money for them through the Hike-a-Thon all month long). 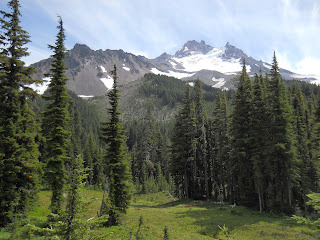 Jefferson Park was absolutely breathtaking, with Mount Jefferson towering high above to one side. But I pulled myself away and continued hiking. As the trail climbed up and out of Jefferson Park, I noticed a fire plane that started to circle over Jefferson Park. Why was it circling over Jefferson Park? There was no fire there. And the noise it made was rather annoying and out of place in the wilderness. I was annoyed by it, but even more, I was worried about it. I wanted to know why it felt the need to circle around several times. It didn't seem like a good omen. The trail reached the top of the ridge, a fantastic view with Mount Jefferson towering above just to the south and Mount Hood a bump on the horizon far to the north, and my heart sank. 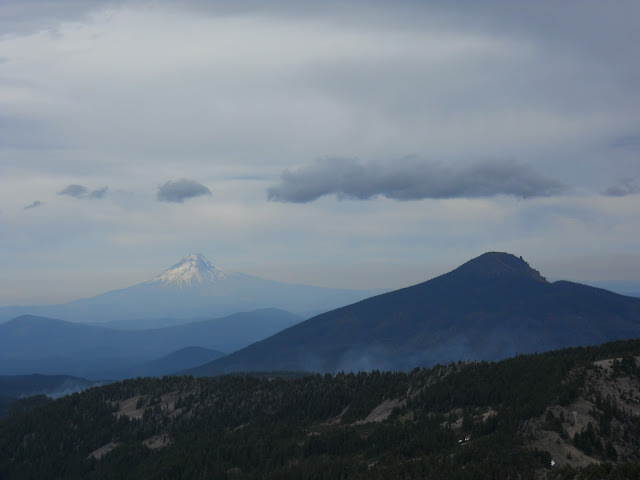 The PCT headed to Mount Hood, that was the direction I would be going, and directly between me and Mount Hood I saw a large column of smoke coming up from the horizon. That wildfire, I knew, was going to be a problem. My luck had finally run out. While I knew the trail would go to Mount Hood, I also knew that the trail was never very straight, and I held a small hope that maybe the trail would zig and zag and completely miss the fire I could see ahead. The chance was there, but it seemed unlikely. Nobody I passed hiking southbound mentioned anything about a wildfire on the trail or any fire closures, though, so I still had a small sliver of hope, but the clouds seemed to turn gray to match my mood. "Well," I told myself. "I suppose if there is a wildfire in your way, at least it'll give you something interesting to talk about." I've walked through wildfires before in Florida. It's not something that gives me a happy joyful feeling, but I might still be able to get through the fire if it's not too bad. If it's in the "still smoldering but largely out" phase, it wouldn't be a problem. But I really had no idea what to expect. I heard no news about a fire on the trail, and until I could get closer to see exactly what was happening, I couldn't know if it was passable or not. Nothing to do now except keep hiking and see what happens. Then I promptly lost the trail in a large patch of snow. The irony was not lost on me. 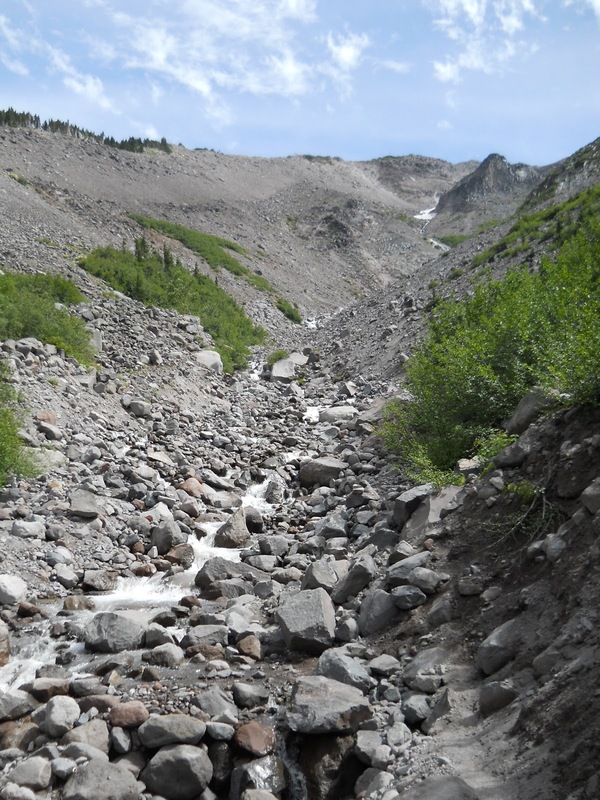 Here it was, late August, and I've lost the trail in the snow while worrying about wildfires. I threw a few curse words at the PCT. There had been small patches of snow on the trail all month long, but never large enough that I couldn't see the trail coming back out the other side of the patch--until today. The snow was hard-packed and difficult to walk on, and I slipped and slid 15 feet down a slope. I cussed the trail a few more times, not at all pleased about this development, but picked up the trail again about five minutes later. Compared to the High Sierras, it was nothing. But I wanted to worry about the wildfire rather than breaking my leg on a patch of snow. The trail descended down towards Skyline Road, and as I got closer, I could smell smoke in the air. Smells like a campfire. A very, very large campfire. The wildfire was close now. I could now see individual columns of smoke rising into the air ahead rather than the large single cloud of smoke I first saw, but I didn't see flames shooting out and the wind was relatively calm so I wasn't particularly concerned about a wildfire racing up the mountain faster than I could escape it. The scenery today was just beautiful! 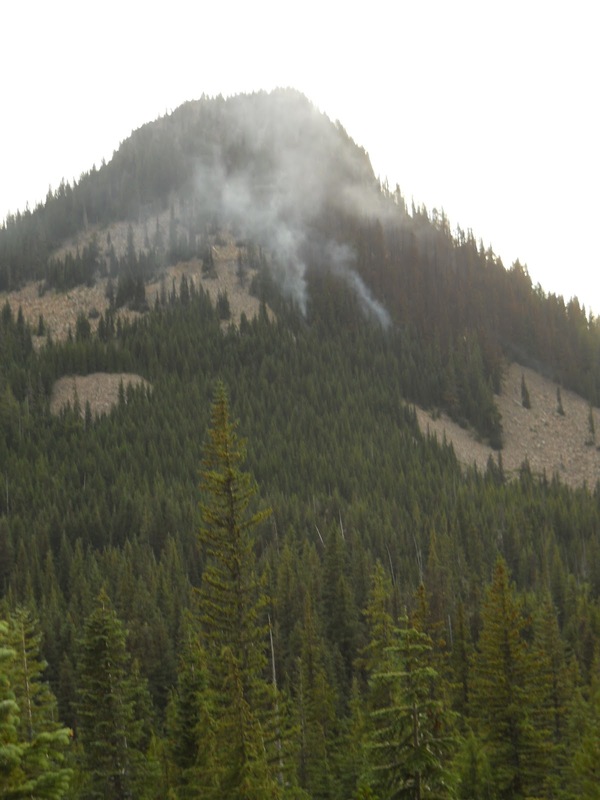 The trail went around the right side of a small hill, and I could tell that the mountain was burning. Or at least smoldering. It couldn't have been more than a few hundred feet away. If this was the worst I would see, it wouldn't be a big deal. I'd seen campfires that looked more scary than this. I reached Skyline Road and saw yellow tape stretched out across the trail. The PCT was closed. Damn! Now what? Hastily erected signage explained that the PCT through the Olallie Lake Recreation Area was closed due to wildfires, and a hand-drawn map suggested two possible alternate routes around it--both of them long road walks that would skip about 38 miles of the official PCT. I examined the hand-drawn map and took a photo of it so I'd have a record of it in my camera, and I pulled out my own maps to compare them to and get a better idea of what I might expect from each of the two alternatives. Both alternatives looked to be about the same distance, the first several miles overlapped, though, so I wouldn't have to commit to one or the other just then. I needed to follow Skyline Road out several miles to a larger road to the west. From that larger road, the two suggested alternate routes split. Route A appeared to be slightly shorter, but the roads also looked bigger and busier. Route B seemed slightly longer, but also looked more remote. I wanted remote and short, and neither route seemed to excel at both. I also had another problem--my maps didn't include information about campsites or water sources along these alternate routes. I didn't have any idea if I'd be able to find a place off the side of the road to camp or how much water I needed to carry. 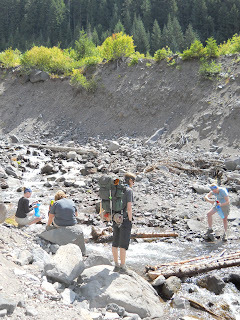 I'd probably be able to find somewhere to camp off the side of the road, and I'd probably find water sources fairly regularly, but I couldn't know for certain. 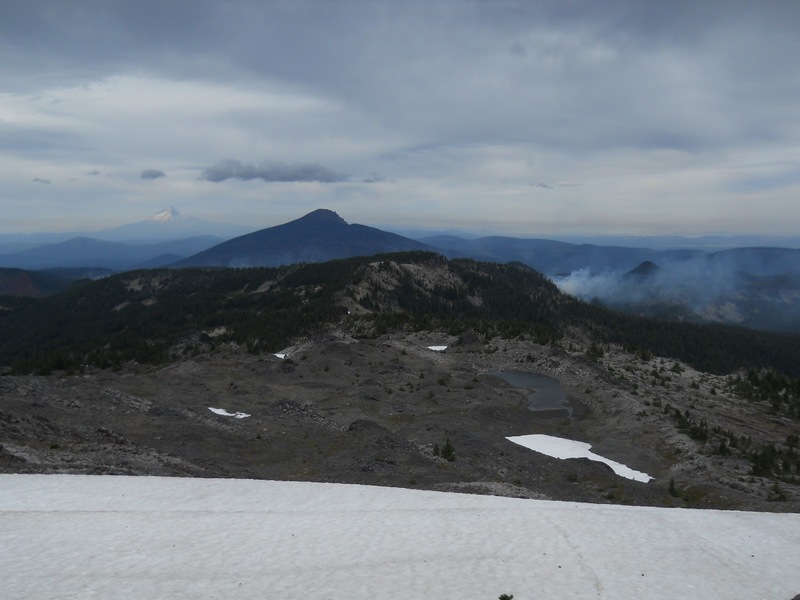 It appeared that it would add at least an extra 15 miles to my hike, so my arrival into Timberline Lodge would be delayed by half a day at least. Food wasn't a problem--I usually pack an extra day's worth of food "just in case." Usually that meant, "just in case I was feeling particularly hungry," but this time it would be because it would take a bit longer to get through this section than expected. Not a big deal on that count, but I wondered how other hikers would fare. 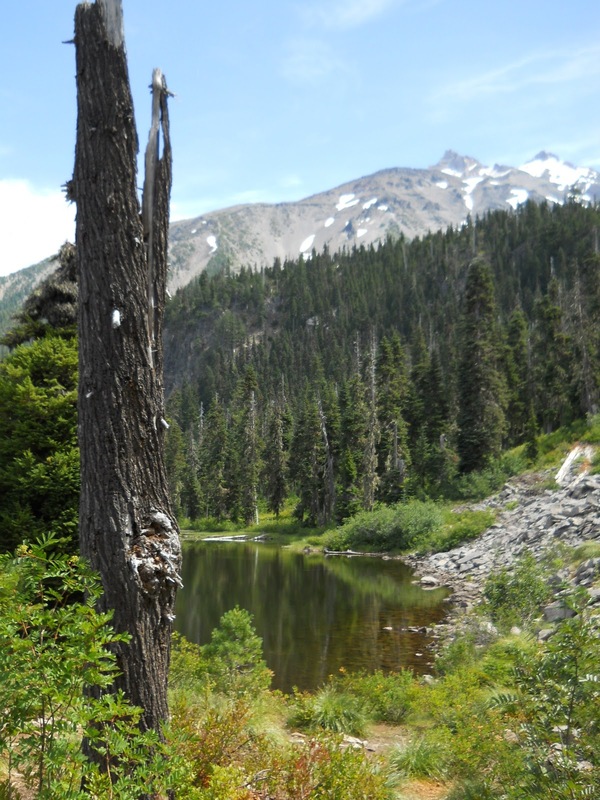 Some people even used Olallie Lake as a maildrop. Those hikers would be in a lot more serious situation than myself! A small creek flowed nearby so I decided to stop for dinner right now to take advantage of the unlimited water supply that I had at the moment. It also gave me time to think and plan. My membership dollars at work! I finished dinner, loaded up with a lot of water since I wasn't sure where the next water source would be, and headed off down the old forest service road. Absolutely nobody was around. I expected to see the occasional fire truck or something--this was a wildfire closure, after all, but I saw nobody and no vehicles. I did see footprints on the road, so I knew there were hikers ahead of me following the detour, but I didn't know who they were or how many there were. I didn't even know how long the fire closure had been in place, and I was still a little annoyed at the southbound hikers I passed who gave me absolutely no warning about the closure. 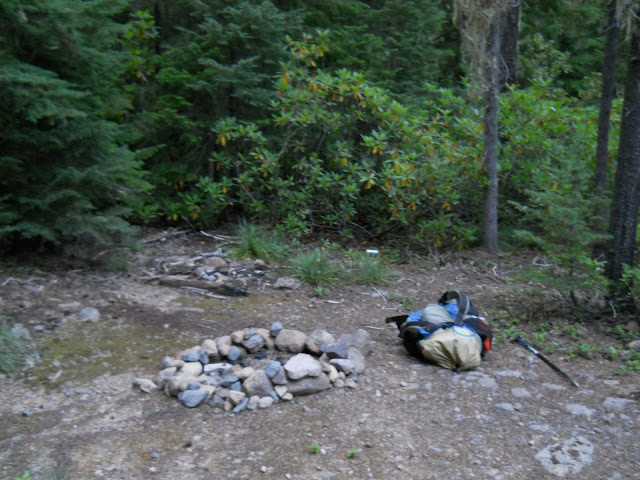 After about five miles, I stopped and set up camp along the road, next to an old fire ring someone built in a pullout. I could have hiked a bit further, but the next road this connected to looked a lot bigger and busier and it could be challenging to find a safe, quiet place to camp there. This road was completely abandoned--even by fire personnel!--and I could safely camp along the road itself. 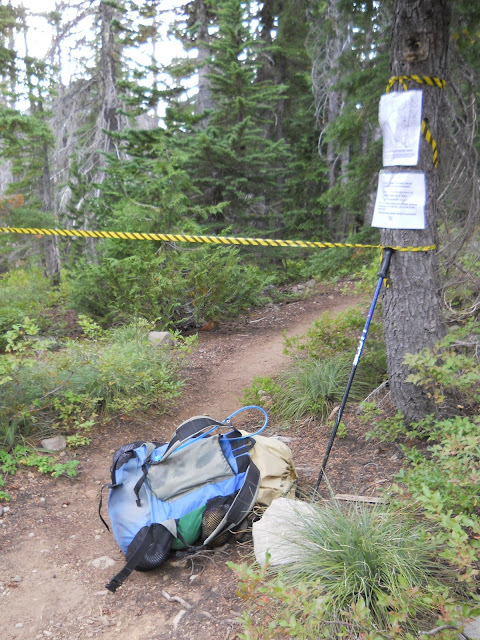 The alternate routes went nearly another 50 miles before returning to the Pacific Crest Trail. 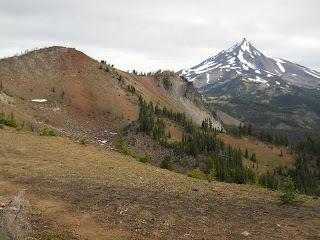 I really wanted to reconnect with the PCT by the end of day tomorrow, but that was a long distance to travel in just one day, and I didn't think I could do it. I might have to stealth camp along a relatively busy road, but I felt lucky to have arrived here when I did. It was a great place to camp, and set me up perfectly to push through the rest of the road walk and reconnect with the PCT tomorrow. social trails through the meadows. I set up camp and pulled out my maps, pouring over the details. My goal, what I really wanted to do, was get back on the PCT as quickly as possible. It was nicer than a road walk, and it was safer to hike on, and it was safer to camp on. I needed to figure out a way to get back to the Trail by the end of day tomorrow, but I still had nearly 50 miles of road walk ahead. 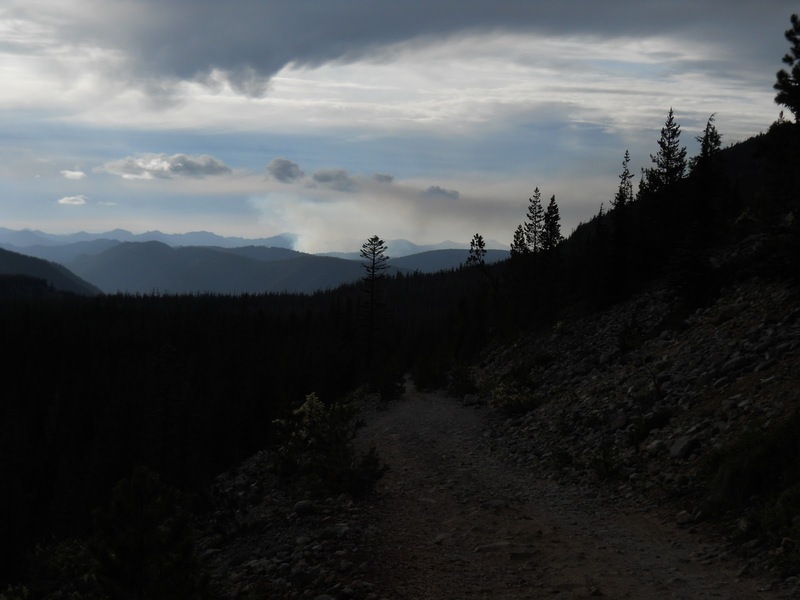 I pulled out my camera too--I had taken a photo of the fire closure--and noticed that Alternate Route #2 came to within a mile or so of the PCT, then followed a road parallel to it for a dozen miles. There were no roads or trails that cut from the road to the PCT, but it was completely outside of the fire closure area. And, in fact, the road did intersect the PCT about a mile south of the road closure. 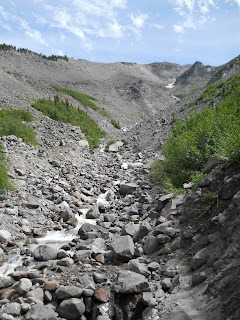 Maybe I could sneak through the closure--only about a mile or so--reconnect with the PCT and cut out a dozen miles of road walking? If that road was as empty as the one I was now camped on, nobody would be the wiser. If I couldn't sneak through on the road into the fire closure, maybe I could hoof it cross-country between the road and the trail just north of the fire closure? Hmm.... I didn't like the idea of going cross-country. If I slipped or hurt myself, nobody would know where to look for my body. But I just needed to follow that road for a measly little mile to reconnect to the PCT. The fire was likely burning far away from it, deep in the interior of Olallie Lake Recreation Area--not on the northern edge of the fire closure. I guess I couldn't really make any final decision until I saw the situation myself, though. Or maybe I'd pass a person hiking southbound who could give me information about the conditions ahead? 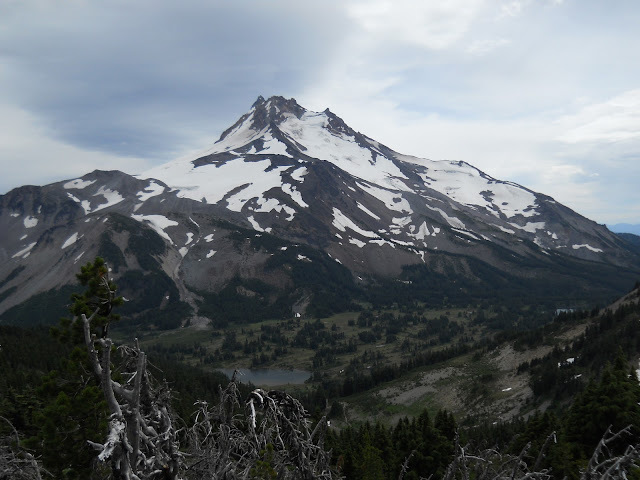 Mount Jefferson, with Jefferson Park below. rising from just behind that hill in the foreground. There's a wildfire directly between me and Mount Hood. Crap! in the foreground was giving me a very bad feeling. My uneasy feeling just went up another notch when I reached this viewpoint. the right side of the smoke just below it, then around the left side of the smoke just above it. the burning area. Crap! On the plus side, however, the trail itself did not appear to be on fire! This was the end of the trail for me. It was time to detour off the PCT. would be extended even further south than where I hit the detour. I didn't know it at the time, but I was very lucky to get through when I did! of the trail. Only later would I learn that this one was burning in the Bull of the Woods Wilderness. And this would be the day that you missed the bit o' mischief created by myself, Wildhair and Mr.&Mrs. Doubletree that I left for you at the PCT/Carl Lake Junction. 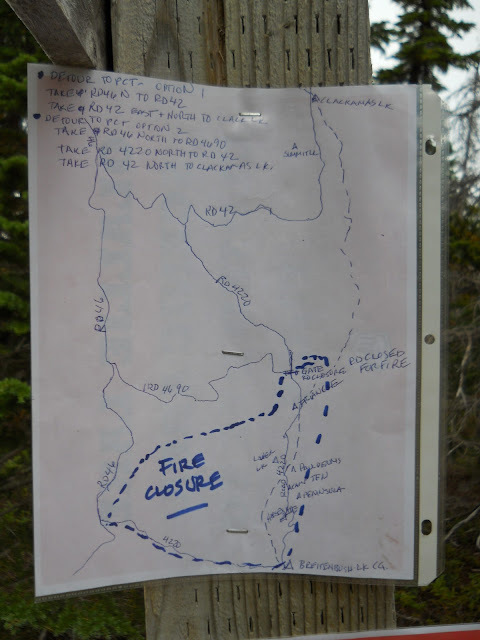 It seems that every year, someplace along the trail is closed by fire. Such a drag! I wonder if the reason you never saw any fire trucks of fire workers on the roads was because they tend to let the fires burn naturally? 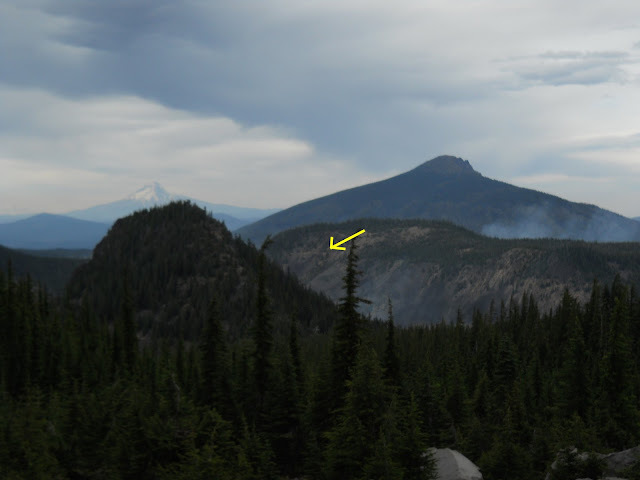 I know wildfires are annoying for hikers, but they are healthy for the forest, as I'm sure you know.